So, I'm wondering what it says about myself if I keep getting my inspiration from my seven year-old daughter. I'm hoping it means I'm still "young at heart". Whatever it means, I stole another one of her ideas. My Elizabeth spent all day yesterday making "cootie catchers" for herself and her sisters - seems it's all the rage in her classroom right now - funny how these things always come full circle. I totally remember playing with these when I was a kid. Anyway, as I picked what seemed to be my hundredth colour and number, I had a great idea. 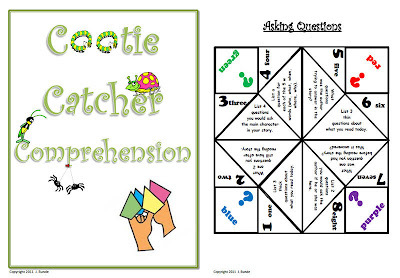 Cootie catchers would be a great way for my students to ask each other questions during our pair/share for independent reading. As I started to plan it out, I thought ... why not make one for all seven of the reading strategies we study (asking questions, determining importance, inferring, making connections, summarizing, synthesizing, and visualizing). I also included a blank template because I think this would be a great way to have students come up with questions and review for a test. My girls were more than happy to oblige when I asked them to try it out - and I'm happy to say it got the Elizabeth stamp of approval. Click on the picture below to check my newest product out at my TeacherspayTeachers Store. I posted another new product this week, as well. I've been doing book talks forever in my classroom, and am just about to assign another one to my students, so I thought I'd upload the file to my TeacherspayTeachers Store. 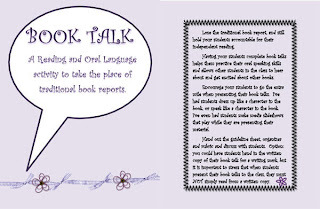 If you haven't done them already, book talks are a great way to keep your students accountable for their independent reading, without assigning the traditional book report. They also help students practise their oral speaking skills, and build confidence speaking in front of an audience. Click on the picture to download a preview of the product. Although I'm happy I got a lot of work done this weekend, the best part was definitely after supper tonight when we made my world-famous chocolate chip skor cookies (OK - maybe they're not world famous yet, but they should be). Another stamp of approval from my kidlets. And the fun continues tomorrow - here in Canada it's a long weekend. LOVE, LOVE, LOVE long weekends! Sidenote: I'm only 10 followers away from my first giveaway!!! I can't wait - it's going to be a great one! Spread the word to help me get to 50 followers. Thank-you!!! Your Cootie Catcher is the BEST idea- for real! And now I want cookies, too. Yummy! You'll have to share your world famous recipe sometime. Thanks, Tamara. And thanks for inviting me to join your fantastic group - I'm loving it!